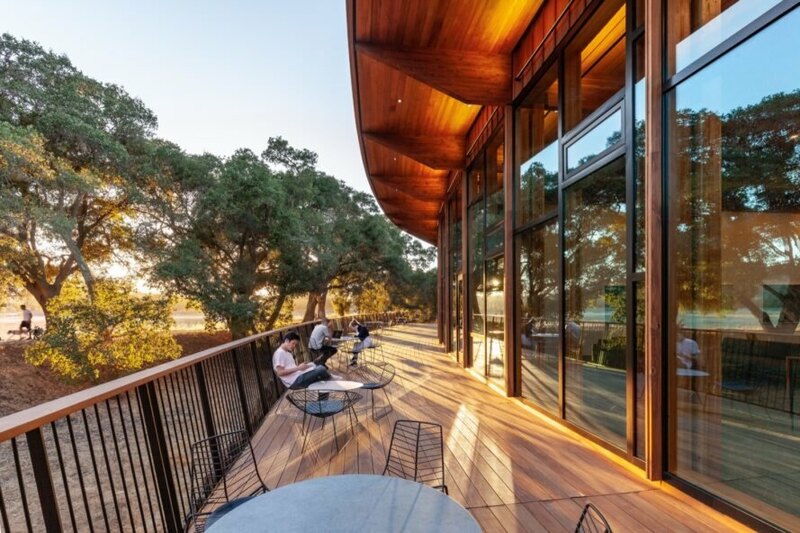 A former parking lot has been converted into the Denning House, the new home for the Knight-Hennessy Scholars Program at Stanford University. The University and the Denning Family tapped New York City-based architectural firm Ennead Architects to design the building as a gathering place for graduate scholars hailing from international backgrounds and diverse disciplines. 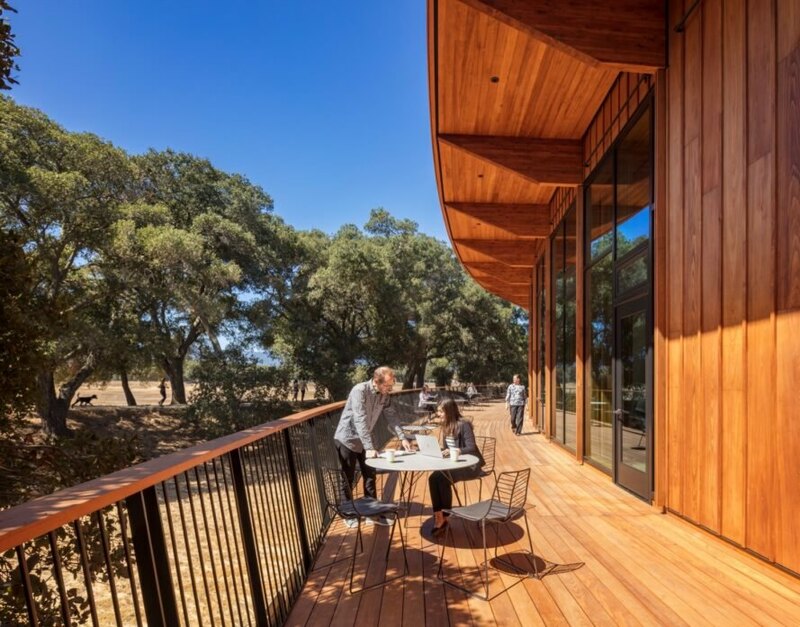 Wrapped in timber and surrounded by California oaks, the Denning House has a treehouse-like atmosphere and sustainably embraces the landscape by minimizing site impact, tapping into natural ventilation and using bird-friendly glass to reduce bird collisions while improving solar performance. Located at the edge of Lake Lagunita and surrounded by a dense forested landscape, the Denning House design draws inspiration from its site surroundings. Hidden in the trees, the 18,000-square-foot building features a Douglas fir wood structure that’s clad in cypress with interiors lined in Douglas fir. 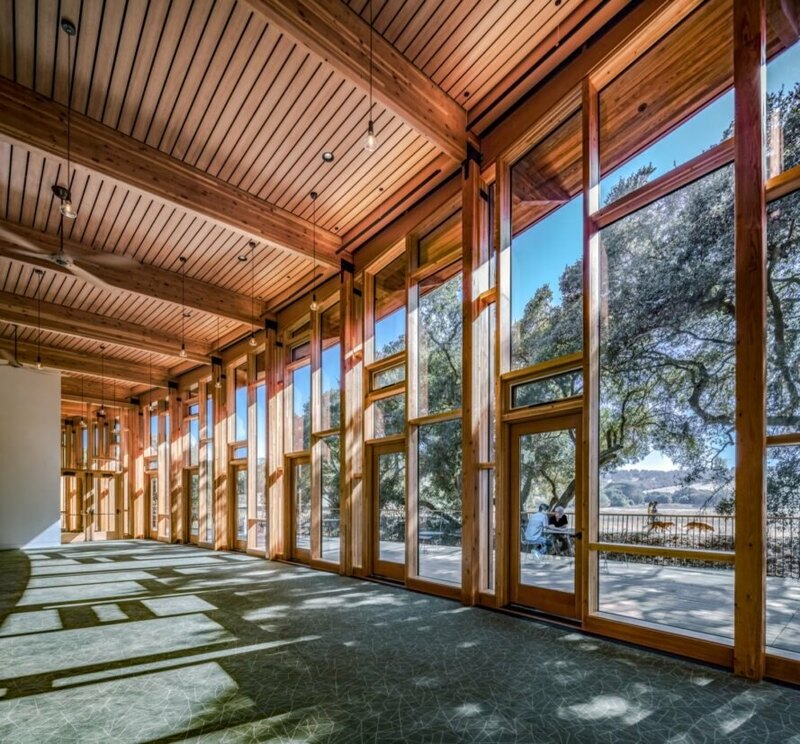 The exposed wood, expansive glazing, and open-floor plan makes the indoor environment feel seamlessly connected with the outdoors. The building has also been designed for optimal views of Lake Lagunita. 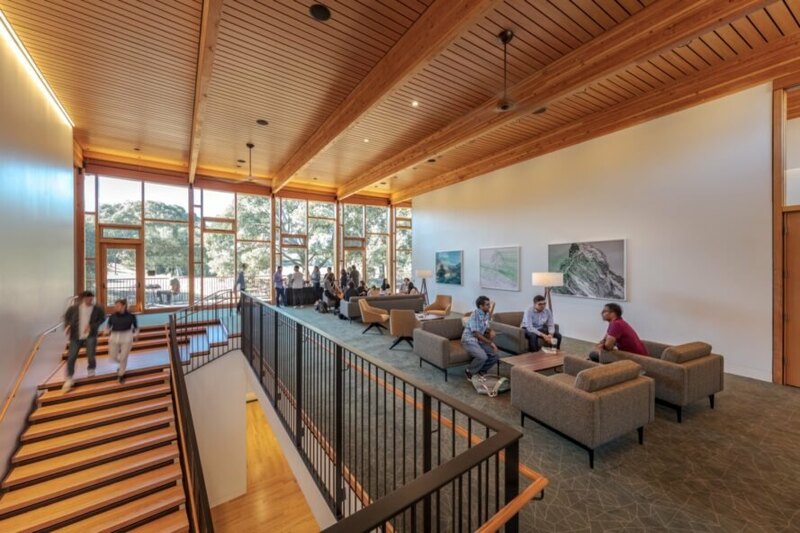 The large public spaces, such as the dining areas, classrooms and lounges are located on the second floor to take full advantage of spectacular lake vistas. The shallow arcing facade also gives way to a continuous outdoor deck from where views of the lake can be enjoyed. Meanwhile, the ground floor is given over to administration, conference and back-of-house facilities. “It is a very environmentally immersive site,” said Emily Kirkland, the project architect and project manager. “The building was designed to respect and enhance the symbiotic relationship between visitor and nature, and by virtue of its minimal footprint, help to restore the native landscape.” To further reduce the building’s site impact, the Denning House is set on recessed footings to conserve and intensify native vegetation and is accessed via a gently curving, sloping boardwalk. 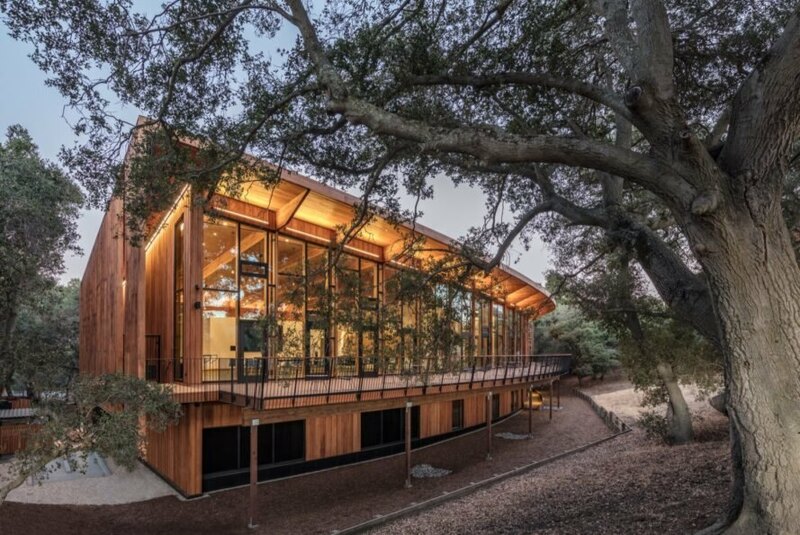 The Denning House is the latest addition to Stanford University. The Denning House sits at the edge of Lake Lagunita. The Denning House it the new home for the Knight-Hennessy Scholars Program. 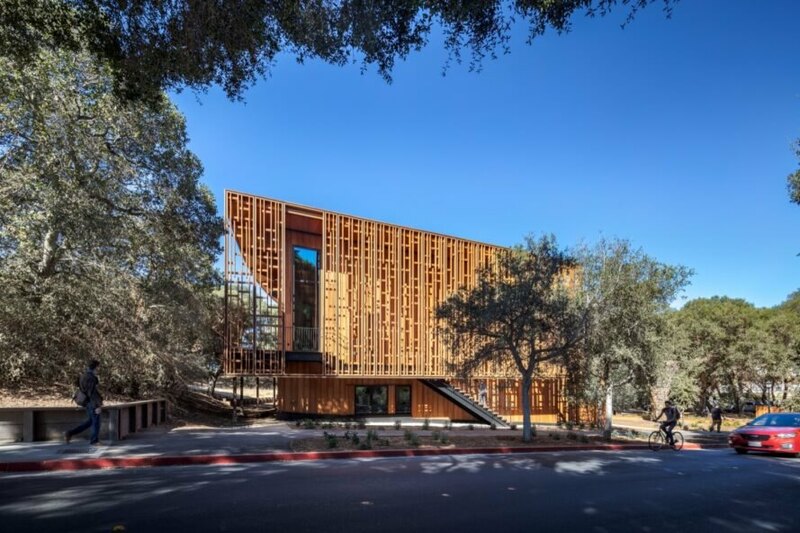 The building is surrounded by a forest landscape of California Oak. The Denning House is intended to be a gathering place for graduates. The building offers a number of meeting, classroom and dining spaces. Ennead Architects built the building on a former parking lot.